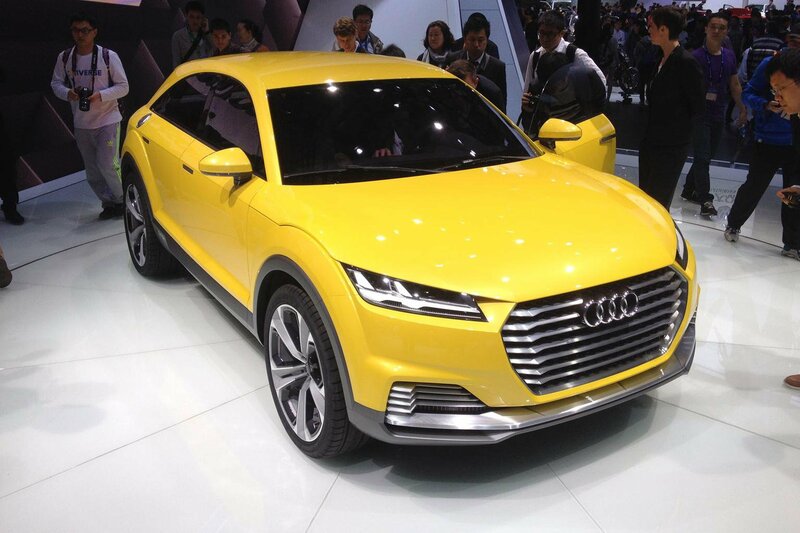 Audi TT SUV concept revealed | What Car? This is the Audi TT Offroad Concept car, which was unveiled at the Beijing motor show and which is being evaluated for production in 2016. A potential rival to the Range Rover Evoque, Porsche Macan and BMW X4, the concept car is a four-door model with individual seats, with the interior closely resembling that of the new, recently revealed Audi TT. Likewise, the advanced plug-in petrol-electric hybrid system – which uses a 2.0-litre turbocharged engine and a pair of electric motors – is expected to be just one of the powertrain options when the production version goes on sale. A more conventional powertrain line-up using engines from the Q3 and TT model ranges is a near certainty.